Coco Tithe Farm is a fully loaded Tithe Farm bot with all the features you need! Script has gotten me about 270 points so far, working very well. Thanks! Outstanding script, both for its speed and consistency. Got me 66-74 flawlessly and is currently doing 74+ at a rate of 110k xp/h. Running into a problem, gricolers water can gets to 10%, and it goes to the shop and then just sits there. I have runes for humidify in inv. It freezes there. @ayzee5793 TY, will fix tonight. 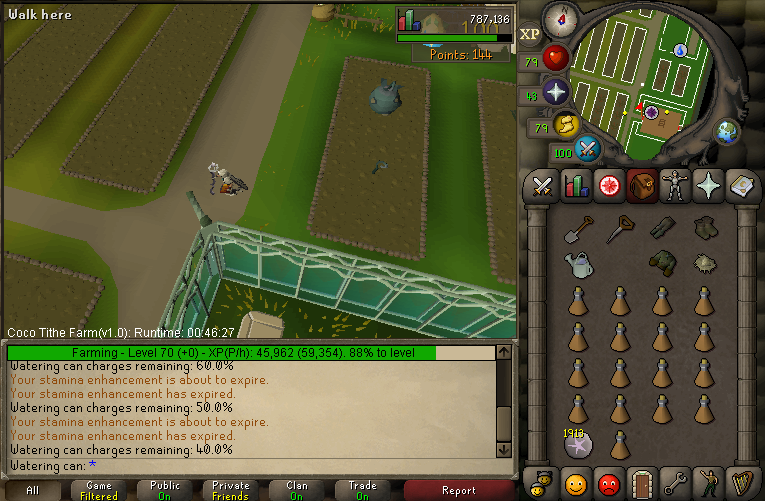 Just have 8 normal watering cans in your inv instead of gricoller's for now if you want to use humidify. Gricoller's isnt filled using magic, you have to go through the shop interface which is probably not working from the sounds of it. Update in Q that should hopefully fix all banking and gricoller's can issues. Sits in the field and fails to use watering can on a plant -> because watering cans are empty.. it doesn't go and refill them . Also if you start in the bank then it fails to grab anything from the bank -> presses withdraw X repeatedly. @sykrot You need to have at least 8 watering cans. It only banks to get more potions. @Snufalufugus Thank you, works great now. I should have read the comments before complaining .